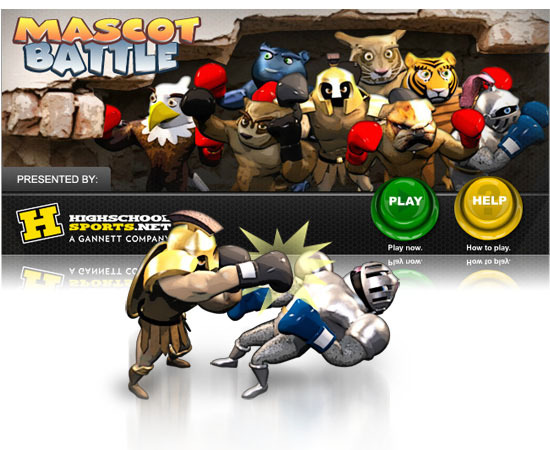 Mascot Battle is a game that I proposed, designed, and lead the effort to create for USA TODAY Sports - HighSchoolSports.net. I researched school mascots and found that the most common were the Eagle, Tiger, Bulldog, Panther, Wildcat and Knight. Each character has different strengths and weaknesses, and the game is balanced to encourage players to block, move in and out, throw combinations, and to get the pre-fight boost trivia questions correct. Players who log in and win can record votes for the next two mascots we'd create, and the top three players in victory count would win gift cards. During our slowest months of the season, Mascot Battle generated about 35,000 plays, and the top three players had over 1,000 victories each. The Spartan and Wolverine were created and added to the game as a result.